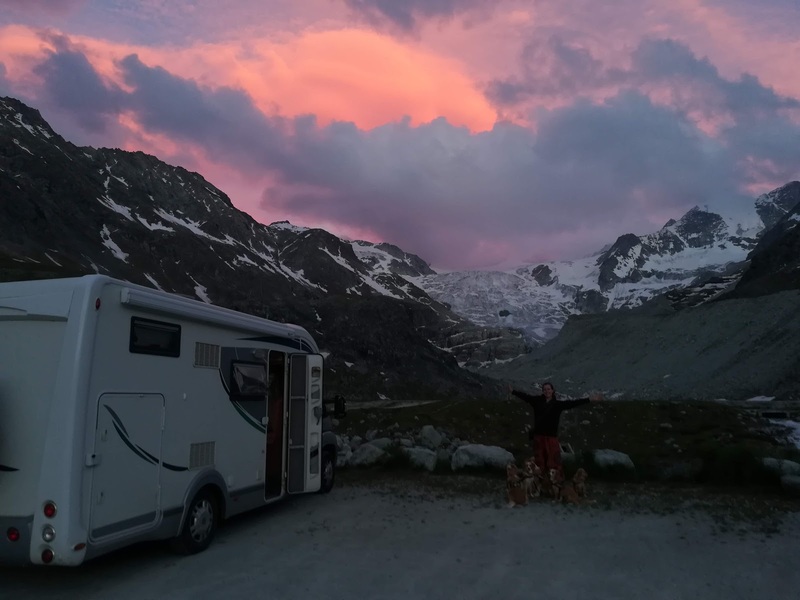 We arrived in Saas Fee late on Monday evening following our amazing walk from Zermatt, having decided to move so that we could get an early start again the next day and make the most of the beautiful weather forecast to continue. At 1800m, as the sun disappeared behind the surrounding peaks, the temperature plummeted overnight and we were two chilly campers the next day as we donned our hiking gear ready to leave the van excited at the prospect of some awesome glaciers nearby. The Saas Fee valley boasts more percentage area covered by glaciers than any other in Switzerland at over 50% and thanks to our meeting with Anne and Glenn in Grimentz some 2 ½ months ago we had heard about the Saas Pass – a card you can buy for just 5 CHF each per day alongside your normal 'tourist tax' (unavoidable in Switzerland it seems) giving access to all of the cable cars in the area. “Why walk when you can ride” we thought and so dashed straight to tourist info to get our 2 day Saas Pass and explore the awesome scenery on offer. Passes in hand and we were straight onto the Alpin Express, leaving Saas Fee and climbing up to Felskinn station at 3000m. Rising up steadily with just the 2 of us in the car, having beaten most of the crowds, we began to pass over the bare rock of the mountain and past the tongue of the enormous Feeglestcher stretching down towards the town. In previous centuries the glacier had reached Saas Fee itself, then a tiny village. Nowadays it has retreated hundreds of metres higher and towers above the sprawling tourist complex, but from our rising vantage point the blue tinged ice and deep crevasses were majestic. Arriving at Felskinn we dashed straight to the Metro Alpin, the highest Metro in Europe which passes through the mountain rising a further 500m to the Allalin station at 3500m – higher than we have ever been before. Emerging into the sunlight we were gobsmacked by the view. Without a cloud in the sky every direction we looked in showed another 4000m peak decorated with cascading glaciers, including right back over Saas Fee to the Bernese Alps of Central Switzerland including the Eiger, Jungfrau and Monach and even the hint of the mighty Aletsch glacier we had visited in July. We could see why the tagline we had seen in the tourist office, “more 4000's you won't see”, was justified from this high vantage point. Moving slowly around the station, from where summer skiers enjoy the permanent snowfields to race across the glacier surface, we just couldn't take it all in and as other tourists came, took some pictures and left, we just sat captivated by the beauty all around for hours. Venturing inside the Allalin station we were also happy to discover we had access to the Eispavilion, a stunning cave network hollowed right into the glacier itself and descending some 20m or so beneath the glacier surface. The chill of the glacial air as we entered froze our noses, but the reward of the grottos beneath, decorated with ice sculptures, soft lighting and information about the glacier was incredible. It was almost unbelievable to be walking within the glacier itself, surrounding by millions of litres of water frozen as blue tinted translucent ice formed into twisted caverns. Back above ground and we sat again in the sunshine, staring at the peaks and not wanting to leave this paradise. However, after several hours the pistes closed and the station started to get busy, so after making one more foray into the glacier, we hopped back on the metro and made our back down to Saas Fee, where we immediately hopped onto another cable car, this time towards the Langfluh station at 2870m. Despite being some 630m lower than our morning vantage point, Langfluh is positioned right up against the crevasse ridden Feegletscher and we wanted to get closer. As the afternoon was drawing on, many of the other visitors had departed when we arrived and so finding a handy rock we enjoyed a peaceful half an hour staring over the expanse of tumbling ice with crevasses that would swallow up a tower block before it was time to descend ourselves as the lifts were closing. Sitting back in the motorhome that evening reflecting on what we had seen, we couldn't believe our luck at the value of the Saas Pass and the unbeatable weather that allowed us to enjoy such an awesome day. In fact the following morning we were out by 7.30 to catch one of the first lifts straight back up to the Allalin station. Joined only by a few skiers, who seemed to be professionals training (not a bad commute to work), the 2 hours that followed where we sat in almost complete isolation in the sunshine staring over the near and distant peaks once more was blissful. Sadly (for us) it couldn't last all day and as the crowds began to arrive at 10ish we made one last tour of the Eispavilion before heading down by midday, saying a sad farewell to our glacier paradise. Although we were moving on that evening (as it was an expensive place to camp) it is another bonus of the Saas Pass that it includes the nearby resorts of Saas Grund and Saas Almagell as well, plus buses between them and so we made the most of our remaining time in the valley by hopping on the bus to Saas Grund and catching the Hohsaas cable car. This time rising up to 3200m, we were treated to a view right back across the valley to the expansive Feegletscher we had stood above not 2 hours before plus a host of other glaciers on surrounding peaks which had previously been hidden from view. We took a stroll around a convenient walking loop detailing the 18 4000m peaks visible from here, when they were summitted etc. and right up to the surface of the Triftgletscher. Unfortunately clouds were blowing in hiding the highest summits from sight, but on a clear afternoon it would be spectacular. As we made our way back to the motorhome by late afternoon and prepared to leave, still debating where to, we reflected on the previous 3 days in Zermatt and Saas Fee and the weather that had made them such memorable ones. It is no surprise having had that time why when people used to think of the Alps they thought of Switzerland and we felt very happy with our decision to drive back here before the snow arrives in the next month.